Want to save more money so you have more of a cushion when you start working for yourself? BUT you have trouble sticking to a budget? 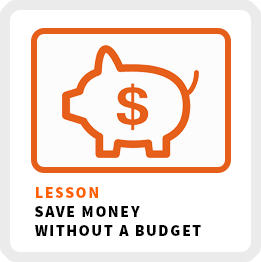 I’m going to teach you how to save money without a budget! 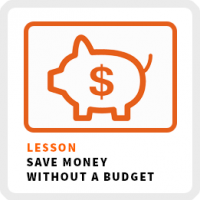 Instead of using a budget to nickel and dime yourself, change your spending habits instead. Budgets are like diets. No one can stick to them and you end up erasing all your achievements once you go off them! If you want real change without the pain of a budget, you gotta change your habits. What I’m about to share with you is learning how to prioritize your spending in alignment with your goals and how you want to live your life going forward. I don’t want you to be miserable trying to save money. I want you to find ways to cut the spending that’s not making you happy or has no meaning, so you can use your money for stuff that you really care about! I once got a friend out of $20,000 in debt in less than 2 years and she was only making $50,000 a year using the advice I’m about to share with you. Let discover how to adjust each of these habits to save you more money without draining your motivation! Turns out your mom was right! You are the company you keep! Humans reflect and mimic the habits of the people they spend the most time with whether they are aware of it or not! We are hardwired to work in groups, so that means adopting shared habits. Make a list of all the people you spend time with for at least an hour a week. Next to each name, write down the 3 most common activities you do with that person. Finally, estimate the cost of each of those weekly activities to determine how much money you spend with each person on a weekly basis. I’m not asking you to ditch any of your friends here! I’m making you aware of the people in your life who trigger you to spend more money then you might on your own or when you hang with other people. This reflection exercise might cause you to re-evaluate your relationships based on the goals you have for your life. You might consider thinking of new, lower cost activities or you might start spending less time with those who have more expensive tastes. We all get stressed out and overwhelmed. We all have our favorite ways of dealing with stress or what I call our “comfort habits”. I want you to focus on all the spending you do when you want to kick back and relax. What activities comfort you when you’ve had a rough day? Might be . . .
Now estimate how much you spend on a weekly basis on your go-to comfort habits. Considering trying new, less expensive and maybe even healthier comfort habits like talking to a friend, walking, reading or your favorite hobby. And don’t be surprised to see a correlation between your comfort habits and the big spenders in your social circle! Finally, we live in some rarified times where you can outsource almost any activity in your life! On an individual basis, the fees to have those tasks taken off your plate don’t cost all that much, but they do add up! Make a list of all the different services you use to make your life easier. Which ones cost the most? Which ones can you live without? How much time are they really saving you? Sometimes these services become such a convenient habit, we don’t stop to reflect to see if the ease they provide is still worth the money you ware paying out for them. Finally, each January I look at all our monthly bills and see how I can renegotiation them. Here are the tactics I use. Everything is up for negotiation, including our mortgage, utilities and other bills you’d never think you could renegotiate! I negotiate with myself first to reevaluate the need for something like our cable bill or Netflix. I ask my service providers if there are lower cost alternatives. I look for new providers to see if I can get a better offer or if a new disrupter has entered the marketplace I was unaware of. I’d be curious to hear what spending habits you decided to change. Share in the LSTM Self-Employment Mastermind or contact me!